Recently, I attended the Facebook Studio Live event in LA. 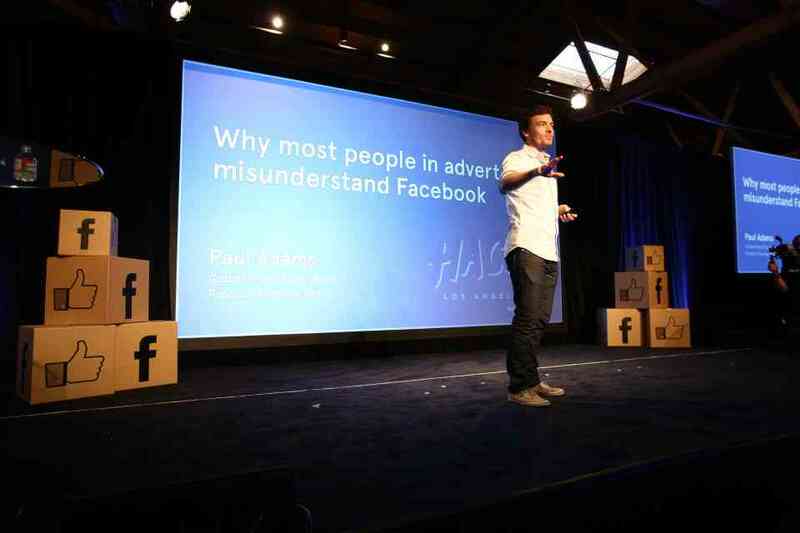 The keynote speaker was author & Facebook employee Paul Adams of the Global Brand Marketing team. Paul provided a very insightful presentation that proved to be the highlight of the event. In February I wrote about the importance of Social Sign-On for brands. Paul’s presentation reinforced this message and also provided additional insight into 3 fundamental shifts that are key factors to what is quickly becoming the next iteration of the web. From a marketing standpoint, these shifts also represent a fundamental change in how we as marketers should approach campaign strategy as well as the design of brand sites moving forward. Lets consider the initial statement “The web is fundamentally being rebuilt around people”. 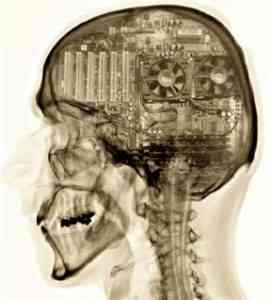 Think about how Facebook has redefined how you as an individual represent your virtual persona. You show affinity towards brands via Likes, your opinion and interaction with others are the keys to fueling the algorithm that shows you the most relevant content. You select the types of content that you interact with from the sources that you deem have value. In essence, you are now in control. The side effect to this control is that you are also providing extensive amounts of data via your social graph that now allow for more personalized experiences across the web. Web experiences have evolved from the early dot com days of simply repurposing marketing materials to becoming more interactive by nature. The web as it stands today, represents incremental innovation when it comes to true integration of social with branded web sites. Strategies today involve “bolting on” social features. This meets a basic need of interconnection, but the brands who will truly capitalize on the next iteration of the web will provide a social by design approach that drives frictionless and relevant engagement to its users. Examples of this concept are beginning to appear across the web as more organizations begin to adopt open graph principles into their brand presence. One example is Etsy. 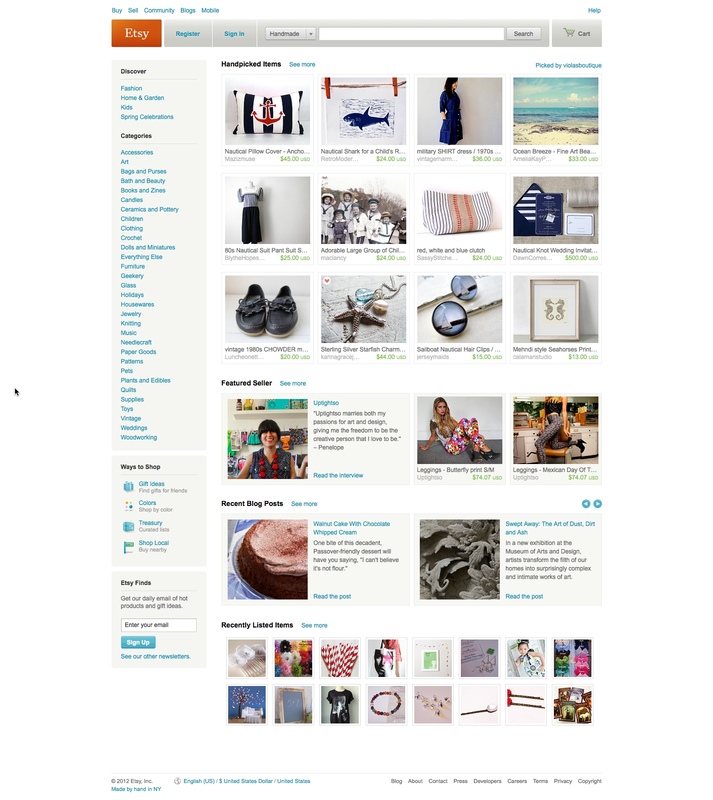 When you initially look at a site such as Etsy, you see a standard web presence that could be any commerce driven site that you have seen before. 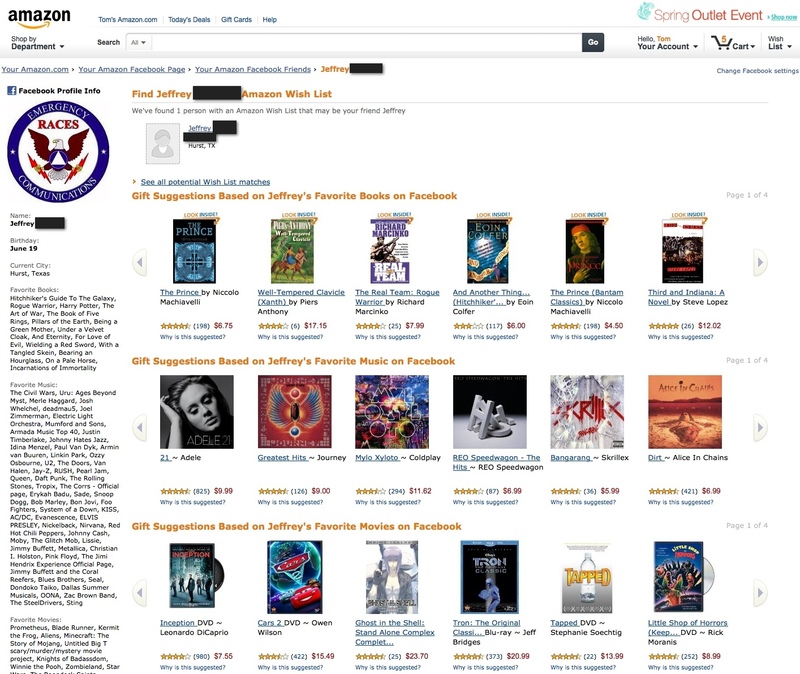 The site puts the onus on the user to drill down via categories or assuming the user knows what they are searching for. By leveraging Open Graph, Etsy is able to create an experience that is incredibly relevant to the end user and their friends by quickly analyzing their Likes & affinities and presenting items that may be of interest. This frictionless discovery increases purchase intent by quickly surfacing items that may be immediately relevant. 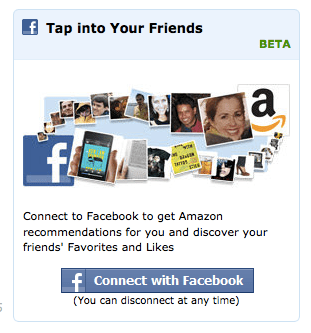 An even richer experience is being provided by Amazon’s new Facebook open graph driven beta. 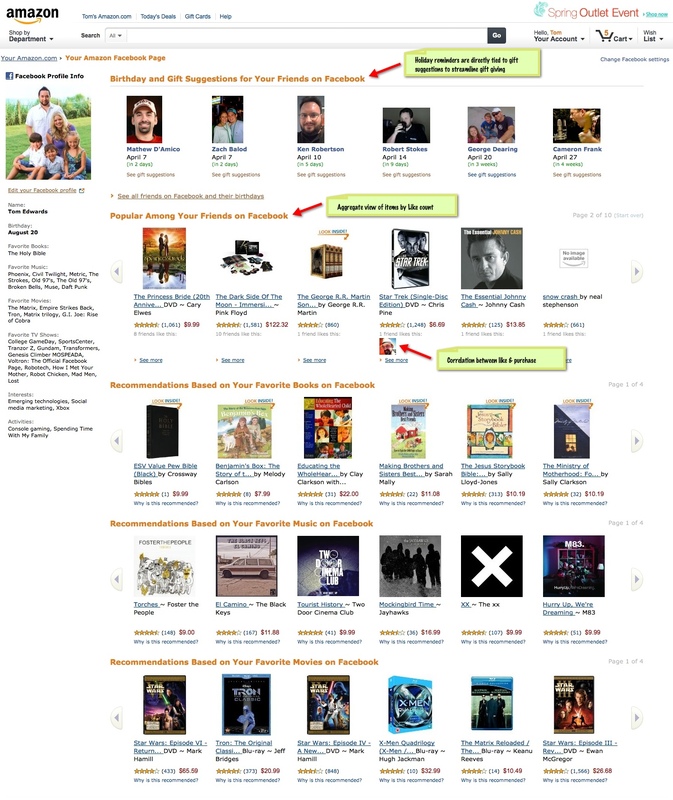 Amazon has been at the forefront of surfacing relevant items based on purchase history. Their relevancy algorithm’s have been a foundational element of their success over the years. 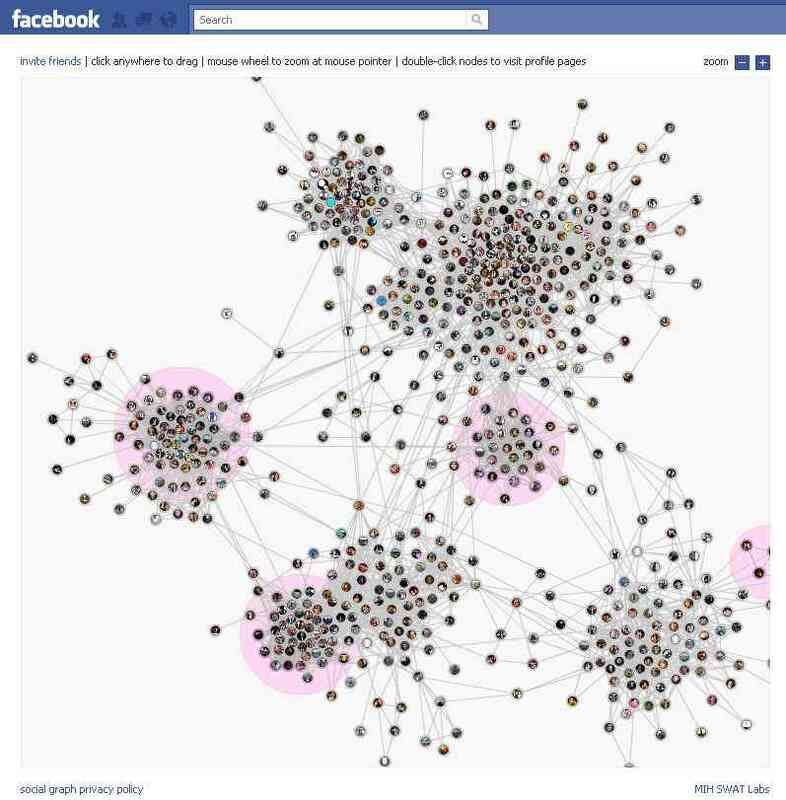 It is very telling that they have recently launched a beta that further integrates a users social graph data to provide additional levels of recommendation. The Amazon Facebook beta experience quickly scans the LIkes of the user as well as the social graph data of their friends to surface targeted recommendations that are based on interaction by friends as well as actual amazon purchase. By adding additional utility in terms of gift giving for friends and discoverability of wish-lists, a user quickly has access to items that their friends may be truly interested in receiving. The process of leveraging social graph data to streamline the path to purchase exemplifies the potential of social graph enabled social commerce. 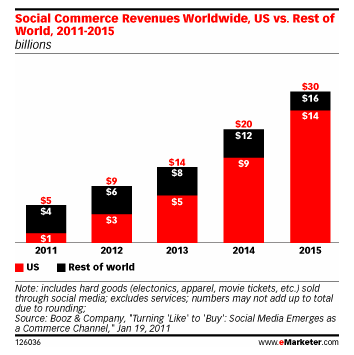 Social commerce should be less about seeding products via social channels, and more about creating seamless experiences that are permissible to end users vs. trying to interrupt. More on the topic of interruptive vs. permissive marketing based on this model in a future post. The relevant web is also incredibly important based on the statements associated with the amount of information that is available as well as our capacity to comprehend information. With the exponential growth of information and choices, our dependency on our closest bonds to help us process information becomes even more relevant. By enabling relevant experiences that users can seamlessly engage with, the ability for brands to capitalize on these fundamental shifts become fully realized. Those that embrace the social graph and redesign their brand presence to seamlessly integrate with social channels vs. simply bolting on features will realize greater returns.